Initial reaction to the ATS Coupe was not exactly positive. Vociferous Autoblog commenters found it "bland" and "boring" upon debut, with many missing the avant-garde looks of the CTS Coupe. The new ATS two-door is considerably more conservative than the CTS, sure, but that's due to customer feedback – Cadillac says customers asked for less visual mass and aggression this time around. We'll have to wait and see how shoppers respond to the new model, but it's worth noting that the wedgy CTS Coupe never set sales charts alight. We should qualify what "conservative" means here. The ATS Coupe, like the sedan, is still a dramatic piece of work in its own right. But unlike the CTS Coupe, the ATS' beltline carries a similar angle to that of the sedan, and the rake of the windshield doesn't appear dramatically different. It's not as easy to immediately spot the differences between the two ATS models as it is with the CTS, but the coupe-specific taillights and offset exhausts are solid touches. Cadillac's interior work has been one of the brand's brightest spots in recent years and the ATS Coupe is no exception. Soft, supple, semi-aniline leather line the seats and armrests, while thin strips of unpolished Sapele wood trim complement the Kona Brown hides of our test car. Black leather, piano black trim and Alcantara round out the finer interior materials, and Cadillac's use of hard plastics is kept to an absolute minimum. Overall, the ATS Coupe's cabin reminds us a lot of the new Escalade, which is high praise considering you can almost buy two ATS Coupes for its price. Functionally, the dismissal of two doors has little impact on the ATS' driving environment. The Coupe is as focused as the four-door, with very supportive, 12-way "performance" seats standard on V6 models like our tester. Combined with a leather-wrapped three-spoke wheel that tilts and telescopes, there's plenty of room for drivers of all body types. Unlike the CTS Coupe, visibility is quite good all around. Those rear seats, meanwhile, are more or less only suitable for individuals whose academic pursuit includes regular gluestick use. Should you choose to shoehorn an adult back there, know that the driver's seatbelt doesn't exactly accommodate easy ingress and egress. What's more, while legroom is adequate (assuming a shorter driver), headroom is, not surprisingly, the back seat's most limiting factor. From there, the ATS Coupe reads a lot like its more passenger-friendly counterpart, boasting a pair of available engines, standard rear-wheel drive and optional all-wheel drive. The coupe's base engine, Cadillac's 2.0-liter, turbocharged four-cylinder, can be had with a standard six-speed manual transmission, but only in rear-wheel drive. Opting for the 3.6-liter V6 – which we have here – or AWD (with either engine) means living with a six-speed automatic. In case you were wondering, the sedan's 2.5-liter bottom-shelf powerplant has been wisely ditched for this two-door application. The 3.6L sings up to a lofty 7,200 rpm redline, turning out 321 horsepower at 6,800 rpm and 275 pound-feet of torque at 4,800 rpm. The effect of this high redline is that the V6 loves to rev, delivering a delicious exhaust note along the way. The ATS doesn't sound quite as nice as competitors like the BMW 435i and Audi S5, but it also sounds more natural than the artificial, induction-heavy note of the similarly sized, naturally aspirated V6 in the Lexus RC 350. That said, both of the aforementioned Germans feel quite a bit quicker than the Caddy. During our test, we found a disappointing lack of low-end grunt, but after that weak spot, power arrived linearly. Throttle response was a bit sluggish, while the pedal itself felt too stiff to modulate easily. Our tester did have a mere 400 miles on the odometer upon arrival, so that firm right pedal might gain pliancy as the miles pile on. The six-speed automatic is nothing to write home about. Driven normally, it's totally acceptable, delivering imperceptible performance. But once we started pushing, problems arose. While digging into the throttle, there was a notable pause as the Hydra-Matic 6L45 tried to find the appropriate cog. Things didn't improve much in manual mode, either, as shifts felt no more snappy. The large, wheel-mounted paddles also left something to be desired, as they didn't offer enough travel or a pleasingly crisp response. Like the sedan, the ATS Coupe features MacPherson struts up front and a five-link independent rear suspension, while GM's excellent Magnetic Ride Control system is available. This top-of-the-line Premium tester arrived fitted with magnetorheological damping system as standard. Rather inexplicably, MRC is only available on Premium models and can't even be added à-la-carte on lesser trims. Magnetic Ride Control rarely fails to impress, with the two-mode system providing a nice balance between firm, sharp handling, and relaxed, comfortable cruising. But while the distinction between Sport and Tour modes is quite clearly defined on other Cadillacs, the differences are less obvious here. That said, Tour mode does feel firmer in this application than on any other MRC-equipped Cadillac. Of course, part of that can be attributed to the paper-thin sidewalls of our tester's 40-series Bridgestone Potenza RE050A rubber. Overall, the ATS coupe's ride quality was just too crashy, even with MRC set to Tour. Sport, meanwhile, was on the borderline of punishing. Even so, potholes and imperfections didn't send the coupe scurrying all over the road, but occupants could still feel and hear every bump. Impact noises are transmitted quite clearly, while tire roar is a fairly regular companion. One positive side effect of this firm ride, however, was really sharp handling. When thrown into a bend, the ATS cornered with little body roll, even in Tour. In Sport, mode, its roadholding abilities proved genuinely impressive. Whatever minor body roll there was didn't creep up on us, and squat and dive were well controlled. The flat handling did feel biased towards the front of the car, even with the ATS Coupe's 51/49 weight distribution, although we doubt this will bother 99 percent of drivers. What potential customers should care about, though, is the ATS' degree of feedback. We found the chassis talkative, informing us of what was going on between rubber and road. However, that doesn't translate to the steering. The electric power-assisted system is a carryover item from the sedan, ratio and all. This setup is quite numb, and it's absent of feedback on center. It does feel quick, though, and its sharp turn-in otherwise pairs well with the aggressive suspension tuning. Cadillac has fitted uprated Brembo brakes from the sedan as standard on all coupes, blessing the two-door with 12.6-inch rotors and four-piston calipers in front and 12.4-inch discs with single-piston binders out back. Again, this may have been a culprit of our tester's newness, but the brake pedal didn't offer a lot of travel or feedback. Dialing-in braking power was a matter of adjusting to those idiosyncrasies during our first few days with the car. Most V6 luxury coupe buyers don't seem terribly concerned with fuel economy, so the ATS Coupe's 18-mile-per-gallon city and 28-mpg highway figures probably won't be make-or-break metrics. Nevertheless, we faced trouble even achieving the former figure, returning just over 17 mpg during our drive thanks to some admittedly exuberant throttle inputs. 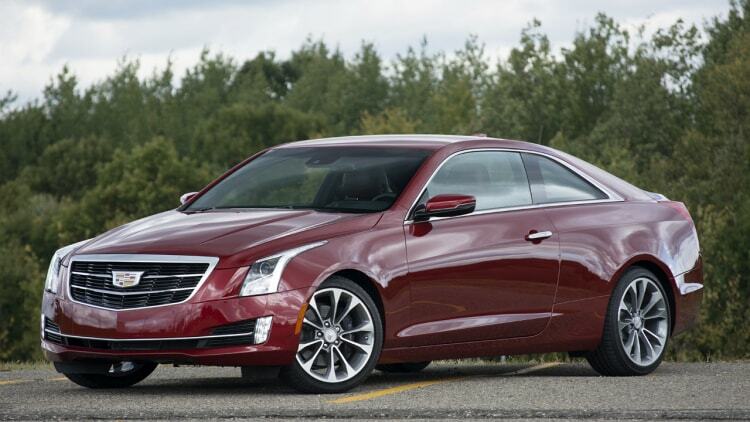 Pricing for the ATS Coupe starts at $37,995, not counting a $995 destination charge. Of course, for that sum, you'll get a 2.0-liter, turbocharged engine, leatherette seats and not much else. Instead, we recommend you opt for the 3.6-liter V6, which starts at $45,150, and then move beyond the 3.6 Luxury and Performance trims and opt for the $50,325 Premium model, which is about $3,200 more than a comparable ATS sedan. The top-of-the-line trim adds navigation, a color head-up display, Magnetic Ride Control and 18-inch forged aluminum wheels wearing aggressive Bridgestone rubber. That all comes in addition to a Bose 12-speaker stereo, lane-departure and forward collision warning systems, Cadillac's unloved CUE infotainment system, and HID headlamps with LED accents, among other goodies. Including Red Obsession paint ($995) and that striking interior scheme ($295), our car's as-tested price totaled $53,610. That sounds like a lot – and it is – but it's a pittance compared to what you'll spend for a comparable car wearing a European badge. The overwhelming issue we keep coming back to with the ATS Coupe is, admittedly, subjective: its looks. Most people buy sports coupes because they want to stand out, not because they want incrementally higher performance. For us, that's why the Audi A5/S5 still works and why the Lexus RC will hopefully work. In our eyes (and some of yours) this Coupe remains too dull. Combined with its lack of space, higher starting price and scarcely superior performance, the ATS Coupe's lack of visual pizazz is just a bit too much for us to get excited about it.